And remember...you can always CHANGE by CHOICE! Last week I shared a topic related to the cost of our decisions; and we dug into the things you are losing, the benefits you are missing out on, and the level of success that you just aren’t reaching because you aren’t willing to invest in yourself, your team or your development. If you missed it, you can listen to my podcast here or check out last week’s blog post. 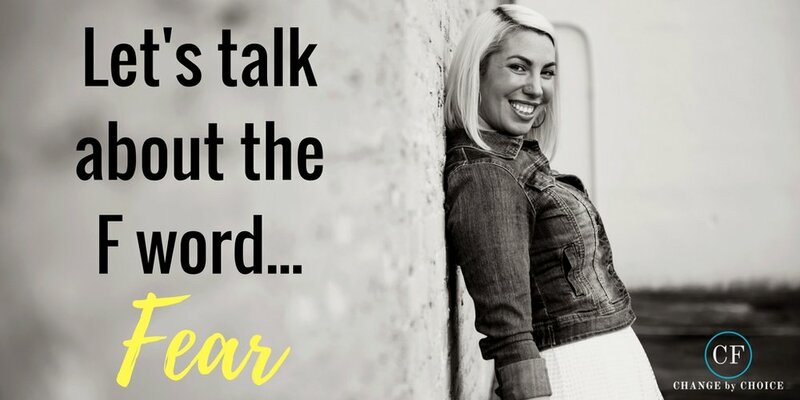 I want to continue that conversation today by looking at another barrier that’s preventing you from reaching that level of success – the F word. Our mind is a powerful thing. It is programmed to protect us. It protects us from what we’ve gone through in the past, our own insecurities, our past experiences, physical pain and being vulnerable. Fear is a survival mechanism – that’s the good part. The problem is that our brain doesn’t know the difference between REAL danger and us just playing small. All it knows is fear. And that tells us not to do things. Do you have fears that are coming up for you? The fear of failure? Of rejection? Of putting yourself out there? Of ridicule? Of losing all your money and resources? In my latest podcast episode, I walk you through the steps to overcome this fear so that you are finally able to level up and achieve the things you want in life. Why is this an important conversation? Because fears can really take over your life if you allow them to. They hold you back. Make you play small. Keep you caged. Especially when we are listening to them and we aren’t choosing our actions PAST those fears. So – how do we choose our actions past those fears? Awareness and clarity are key to everything; once you understand where things are coming from and why they are coming up for you, then you are able to choose differently and make different choices. But you can’t do that without first gaining some awareness and clarity. So, where is that fear coming up for you? And why is it coming up? Here’s the thing about fear. It’s there to protect us; the problem is that our brain doesn’t know the difference between actual danger and us just playing small. A key part here to remember is that when your mind is positioned in a mindset of fear, that is NOT the time to be making decisions in your life. That’s the time where you should be journalling. Take a step back when those fears come up to ask yourself some questions: why am I thinking like this? Why is this fear coming up for me right now? The question “why” is so powerful here and the worst thing you can do is to believe what your head is telling you as though it’s the truth. Because it’s not. Also ask yourself what kind of fear you are feeling. Brendon Burchard speaks of the 3 types of fears that come up most often for people. Loss Pain – the fear that you’re going to lose something in making that choice or taking that action. Process Pain – the process itself – because it’s going to be hard, a struggle, you don’t know how to do it – causes fear. Outcome Pain – the fear that even after you put in all the work, time and energy, you still don’t get the outcome you were hoping for. A key part of this awareness is in clarifying which category your fear falls into. Journal and get clear on the fears that are coming up for you, and why. The power in clarity is that once you have it, you can then choose differently to move through it. You don’t have to do what your head is telling you. You can choose differently. We have to stop living in hope and start choosing the life we want. And that means taking the steps that will strategically move us towards the things we are working towards. Now that you have gained awareness, where do you go from here? The fears haven’t gone anywhere; you have to step into a stronger mindset than the fear. Instead of focusing on what could go wrong…think of it this way. What are the great things that might happen? What does it look like and feel like if you actually achieve it? And what will you learn along the way, even if you do “fail”? It’s a shift in the mindset. The second piece to this is ensuring that you are prepared. Sometimes, we fail because it’s a lack of preparation; we were just frivolously making decisions and spending money and hoping that we hit the right outcome. You need to be strategic, methodical and prepared. If there’s something in terms of skill, experience or resource that you lack, either learn it or have somebody come help you in that area. We have to stop hoping and wishing and we have to start preparing and planning. We have now gone from aware to prepared. You’ve decided that you want it, you’re clear on what fears are coming up for you and why and you know what you need to get there. There still might be fear, and that’s okay; you can talk yourself through it each day because you have gained the clarity, awareness and action to do so. Here’s where consistency and choice come into play – the final piece to this puzzle. There’s the awareness, the clarity, the action and the courage that’d needed, and then comes the growth. Some of the fears that are coming up for you are connected to pieces of yourself that you need to strengthen and grow. You’re not going to do that in your comfort zone; growth happens when you push it to the place of discomfort…where it’s a struggle. Honor that struggle. When you reach the place where, regardless of the outcome of the situation, you can recognize and appreciate the growth and learning that has occurred in the process – that’s powerful. That’s a growth mindset. The opposite is a mindset that tells you that unless something happens perfectly, it was a complete failure. Enjoy the process. Bring joy to the process. You have to make a choice to enjoy it and appreciate it, no matter how hard it gets and no matter the outcome. That’s the key to pushing past the fear. It’s a shift in terms of your mindset. Think about this: how are you speaking to yourself? Are you super critical of yourself? Too afraid to push through? Have all the excuses in the world as to why you’re not taking that step or reaching that next level? Allowing your fears to control your actions? Has that mindset gotten you the results you want? Probably not. Are you going to shift your mindset? Pick small things and act with more courage each day. Do a little something every day. Forward is forward. But when you don’t do anything, because fear is paralyzing you – you don’t do anything. But those small changes that you make, that’s growth. And that’s how you push past the fear that’s holding you back. The good and bad fear – Your new best friends!